LONDON (Sputnik) - Speakers at the fourth Russian-British Business forum held in London on 26 November agreed that trade between the two countries was showing a positive trend despite political tensions. The annual Russian British Business Forum brings together experts from the two countries, who assess market development dynamics and international trade relations and search for ways to expand bilateral and multilateral cooperation. The event was held at the Queen Elizabeth II Conference Centre in the British capital. Russian-UK relations hit a new low following the poisoning of Russian ex-spy Sergei Skripal and his daughter in Salisbury in March. The United Kingdom and its allies have accused Moscow of orchestrating the attack with what UK experts claimed was the A234 nerve agent. Russian authorities have strongly rejected the allegations as groundless. Last week marked another clash between the two countries, with the Anonymous hacktivist group having exposed the UK Integrity Initiative hybrid warfare project aimed at counteracting Russia's alleged propaganda by meddling in the internal affairs of other countries. Addressing delegates in his opening speech, the patron of the Russian-British Chamber of Commerce Prince Michael of Kent, stated that despite difficulties in the current state of diplomatic relations, both Russia and the United Kingdom recognised the importance of mutually beneficial ties. "Of course, we all recognise the difficulties in the current relationship between our two nations, but it is significant that both the Russian and British governments continue to agree on the importance of trade and commercial ties… In 2013, Russia was the UK's fastest growing emerging market, and since 2016 the volume of goods and services traded has again continued to rise steadily," he said. 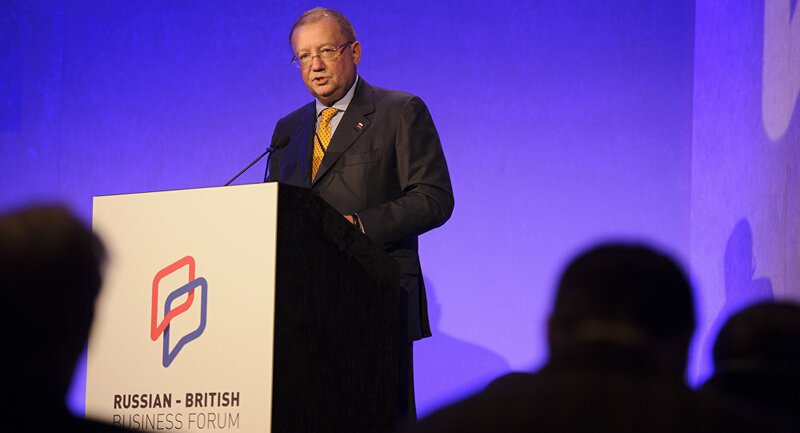 Russian Ambassador to the United Kingdom Alexander Yakovenko also had a positive attitude, arguing that despite the continued burden of sanctions, the Russian economy has still attracted foreign businesses. "Since 2011 Russia has been sanctioned by the United States 62 times… Can you imagine that? And we are still strong, we are doing quite well, and we want to grow. And trade between Russia and the United Kingdom is growing… and it means that business is trying to find the right ways of doing its job," Yakovenko indicated. According to the ambassador, while diplomatic relations between Moscow and London are currently strained, financial relations between the businesses of the two countries are healthy. "These are not easy political relations, [but] I am happy that we are pushing the economic relations… the relations between the people, between the business [sectors]… That is probably the most important part of today's relations between Russia and Britain," Yakovenko stated. A more cautionary tone was, however, struck by the UK's trade commissioner for Eastern Europe and Central Asia, Judith Slater, who claimed that anti-Russian sanctions would remain in place until Moscow desisted from alleged attempts to undermine the security situation in Eastern Europe. "The sanctions are supported by every member of the European Union and they will remain in place until Russia addresses the reasons why the sanctions were put in place – the illegal annexation of Crimea and Russia's role in provoking and continuing the violence in Eastern Ukraine," Slater claimed. Slater, nevertheless, said she believed that there was room for improvement in bilateral relations. "We remain open to a different relationship, one where Russia desists from these attacks that undermine international treaties and international security, and its actions that undermine the territorial integrity of its neighbours, and, instead, acts with us to fulfill the common responsibility that we share as permanent members of the UN Security Council," Slater indicated. One of the forum's panel discussions raised the issue of Brexit, specifically, in relation to UK business access to the Russian market. "You cannot ignore a market [with] the size of Russia," Charles Hendry, the president of the Russo-British Chamber of Commerce (RBCC) Advisory Council, argued. According to the discussion's participants, Russia will be important to the UK attempts to negotiate global trade deals following the country's exit from the European Union, with efforts to overcome current economic uncertainties being seen as vital to securing continued overseas investment.